with Invulnerability for unlimited wounding? But according to what i heard at ffg forums cancelling wound still works. As effects that cancel/flee (Dorway) are usually disrupts so they can be played between "check for valid target" and "resolve effect" so the side that didn't cancel is still wounded be it Khopesh wielder or attacked. I just read that khopesh was errata'd so that putting a wound on your own guy is the cost therefore canceling the wound would cancel the effect. A focused Khopesh deck with Cthulhu/Shub drawing on the full card pool is certainly a beast. Especially after all the Resilient/Toughness options in the Thousand Young box. There are some cards that would be solid competition, prior to them being errata-ed but given the current FAQ Khopesh really is an incredibly powerful card. It's weird though, while Khopesh decks are truly a challenge to beat they rarely seem to win any tournaments, at least around here. Some of the main vulnerabilities of Khopesh include support destruction, blanking, anything that destroys the character, drives them insane, bounces them, etc... Weenie decks that can replace their losses easily are another possible way to go. Anything that takes out the character is getting a 2-for-1 against you too which is good efficiency. I agree with you all. 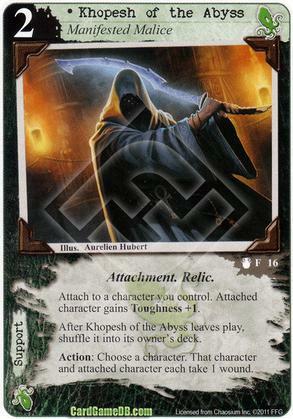 Khopesh is THE card IMO that anyone, beginner or expert, can own with. But an opponent with a strong deck design can overcome a Khopesh. I think what puts Khopesh over-the-top for me is that it keeps coming back. If it were removed from the game after it left play, that would be something, but it just gets shuffled back into the deck for the opponent to redraw. And if the opponent has a San Giorgio in Alga, chances are they're going to almost always have a Khopesh on the table, sometimes the very same copy multiple times thanks to hand-fixing tactics such as San Giorgio. I know shuffling back in is part of the Relic mechanic though. I thought somebody might counter with Stygian Eye or B. Ramsdale Brown or Master of the Myths. Obviously, it depends on the deck each of these cards is in, but it seems like nobody really feels the need to argue against Khopesh. Khopesh is good for keeping the board small, but is, at it's core, rather inefficient. You are spending 2 cards to remove 2 cards from your opponents board unless you play it on a character with Toughness. Also, it becomes very inefficient against opponent characters with Toughness, and a pointless waste against Invulnerable characters. Therefore, it can be useful to keep the board small, but is often not able to deal with your opponents main threats. There are also many counters that can leave your character wounded and the opponents characters untouched like Andrew Chapman, Performance Artist, etc. I would counter that Plague Stone is the Most Powerful Single Card in the game, as it is a complete board wipe that is also a relic. It again has the same counters as Khopesh, and a higher cost, but clears the board regardless of invulnerability, toughness, etc. Savio, Performance Artist, Claret and Chapman are the only common answers. ...and in addition, Plague Stone was in at least 3 (probably more) of the top 8 decks from 2015 Worlds, whereas Khopesh was only in 1.